Schwungrad Energie’s official opening of its Hybrid flywheel-battery pilot. Our Hybrid flywheel-battery pilot facility to provide system services was officially opened in Rhode, Co. Offaly on Wednesday November 9thth by Marcella Corcoran-Kennedy, TD Chairperson of the Oireachtas Committee on Jobs, Enterprise and Innovation. The opening of the Hybrid flywheel-battery plant represents significant progress as we have reached a major project and company milestone. The efforts of proficient local contractors such as RR Projects, Hayden Plant and Pat Howley Electrical have greatly assisted this stage of the project. Approximately 40 jobs were provided in the construction phase of the pilot project, and we feel that it benefited the local economy in Rhode and the surrounding area. This benefit could be replicated at much larger scale should we progress to the 20 MW plant planned for the site. Schwungrad Energie intend to explore other opportunities to generate local employment from our future projects. Already options have been identified for manufacturing, fabrication and assembly of some components locally and we are confident that this has major jobs potential for the future. 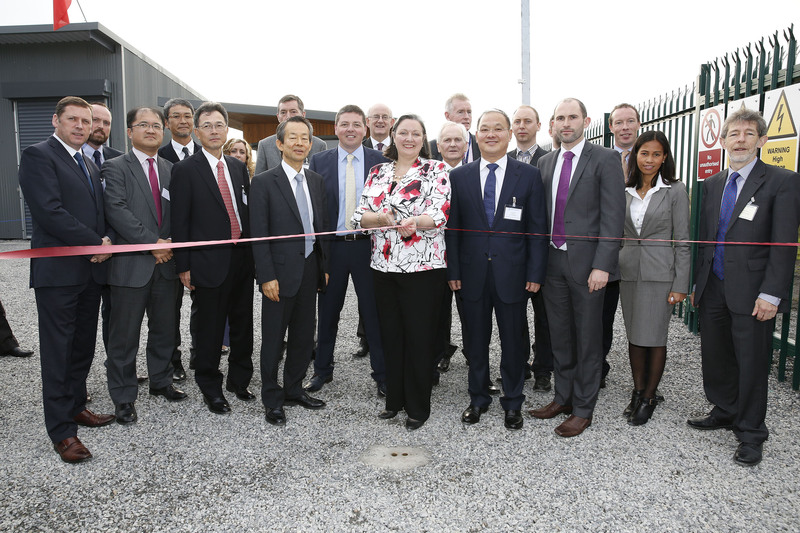 Pictured above, from left to right are; Barry Cowen (Spokesperson on Environment & Local Government), Donal Bourke (Yokogawa), Ogata Hiroyuki (Yokogawa), Hiroyuki Kusunose (Hitachi Chemical), Yoshihiro Nomura (Vice CEO Hitachi Chemical), Doireann Barry (EirGrid), His Excellency Mr. Chihiro Atsumi (Ambassador of Japan to Ireland), Simon Rogers (Managing Director, Yokogawa UK and Ireland), Nigel Reams (Schwungrad Energie), Tom Kelly (Divisional Manager for Cleantech, Electronics and Lifesciences Enterprise Ireland), Marcella Corcoran Kennedy (Chair of Oireachtas Committee on Jobs, Enterprise & Innovation), Peter Duffy (Schwungrad Energie), John McCann (Programme Manager for Electricity and Wind, Sustainable Energy Authority of Ireland), Mr. Jing Ping (President of Liaoning Zhengbang Investment Group. Vice Chairman of Liaoning People’s Political Consultative Conference), Robert Lynch (University of Limerick), Colm Staunton (Schwungrad Energie), Liam Quinn (Local Councillor), Mervyn Keegan (Schwungrad Energie), Lea Collins (Schwungrad Energie), Frank Burke (Schwungrad Energie). Mr Jing Ping – President of Liaoning Zhengbang Investment Group. Vice Chairman of Liaoning Peoples Political Consultative Conference. A warm thank you is extended to all those who attended on the day and participated in the opening ceremony.